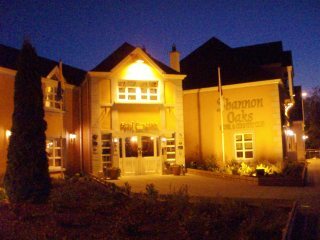 Galway East Tourism - Shannon Oaks Hotel & Country Club in East Galway, West of Ireland.Galway East Tourism - Shannon Oaks Hotel & Country Club in East Galway, West of Ireland. 63 ensuite roomed luxury hotel. Air conditioning, satellite television, radio, hairdryer, trouser press, direct dial telephone and fax modem line in all rooms. Extensive health and leisure facilities. The Shannon Oaks Hotel & Country Club, Close by the serene shores of the River Shannon?s Lough Derg, and adjoining the magnificent Portumna Forest Park offers a setting of unrivalled beauty in the heart of the Galway countryside. Just two hours? drive from Dublin and one from Galway and Limerick. Our central location is perfect for exploring the Midlands and the West. The area has lots to see and do with family-friendly activities such as pet farms, nature trails and equestrian centres nearby. The area is renowned for its angling while there is a superb selection of championship golf courses within an hours? drive. You can also enjoy great shopping in nearby Athlone and Galway City. The hotel has three luxurious accommodation types: relax and unwind in our beautifully appointed hotel rooms, self-catering accommodation in our traditional lodges or our all new contemporary styled two bedroom suites. Other hotel facilities include leisure, beauty and wellness, traditional bar and a choice of two award-winning restaurants, banqueting, wedding and conference facilities - all in a spectacular parkland setting. Sat Nav co-ordinates N5305.45, W00813.45.